Former US Vice President asked whether he will challenge Trump for the presidency, says he is not running for the time being. Former US Vice President Joe Biden is not running for president in 2020, at least not for the moment. 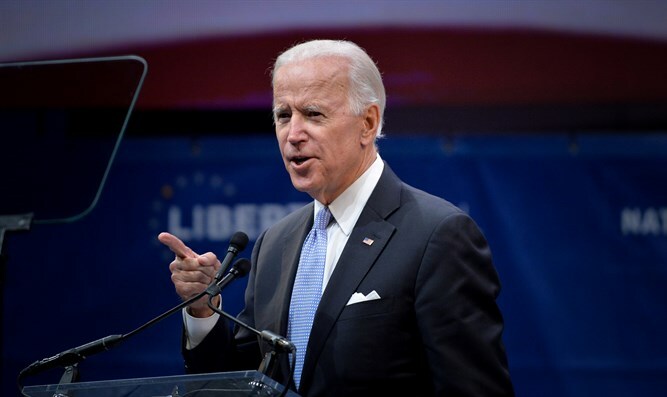 Biden, who spoke at an event in London on Wednesday, sidestepped a question about his intentions, saying he is not running for president "at this point." Biden was asked about whether he could provide the best alternative to President Donald Trump when it comes to foreign policy, according to CNN. Instead, Biden argued every potential Democratic contender for the 2020 presidential campaign would adopt a "more enlightened foreign policy" than the current president. "I think there are many people in the Democratic Party that can defeat Trump and not a single aspiring candidate that I can think of for the nomination -- and I am not one at this point -- does not have a better understanding and formulation of American foreign policy than President Trump," he said. "I'm not being rankly partisan here -- the President acknowledged at the outset he didn't know a lot about foreign policy. He said he watched the news, although I think he's getting more and more informed out of necessity," he added. "I think there are any number of potential candidates seeking the nomination from (California Democratic Sen.) Kamala Harris to a whole range of people in my party who would pursue a much more enlightened foreign policy than the President." The former vice president has said he will decide whether to pursue a presidential bid after the midterm elections. Biden decided against running for president in 2016 following the death of his son, Beau, from brain cancer. Trump has previously described the prospect of running against Biden in 2020 as a "dream." While Biden urged the American public to give Trump a chance after he was elected, the two have also locked horns. Earlier this year, Biden suggested that he would “beat the hell out of Trump” over how he relates to women. "Crazy Joe Biden is trying to act like a tough guy. Actually, he is weak, both mentally and physically, and yet he threatens me, for the second time, with physical assault,” he wrote. "He doesn't know me, but he would go down fast and hard, crying all the way. Don't threaten people Joe!" Trump added. During the election campaign, Biden had harsh criticism for Trump, saying he had “no clue”. In another instance, Biden said that Trump “would’ve loved Stalin”. Biden also criticized Trump’s decision to withdraw from the Iran nuclear accord and reimpose sanctions on the Islamic Republic. He called Trump's move a "profound mistake" and "unnecessary crisis" that alienates key allies.